I was born at the end of the 1960's and unlike a lot collectors I know, I don't have personal memories from the period that Hamlton was making watches in Lancaster, PA. Maybe I'm an "old soul" but when I think about this era I have to rely on the movies and TV shows I've seen and old family pictures. In short, I have to rely on my imagination. So when I think about the 1950's I think about cars with big fenders, cowboy movies, and a fascination with "outer space". I don't know about the Wild West, but you can often see design themes in Hamilton's watches that are reminiscent of big fenders and of space. Take for example the 1958 Automatic K-409. It was produced for only two years. It reminds me of outer space for some reason - especially with the black dial. The most noteworthy feature of the K-409 is the "exploding dial". The watch came with either a white dial or a black dial and both featured solid gold numerals and hour markers. 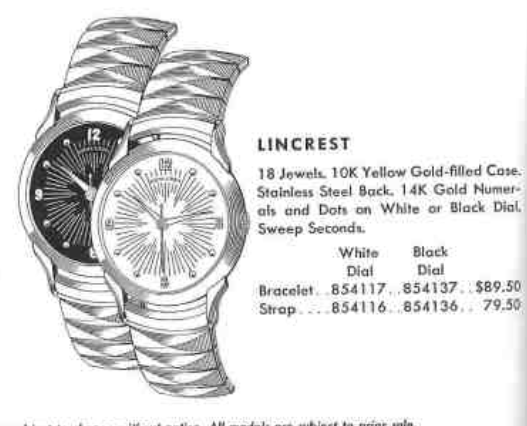 The K-409 is very similar to another model, the 1957 Lincrest. The Lincrest isn't an automatic and although it's similar, it has a couple of key differences... most notably numbers at 3, 6 and 9 instead of marker and a one-piece dial design. 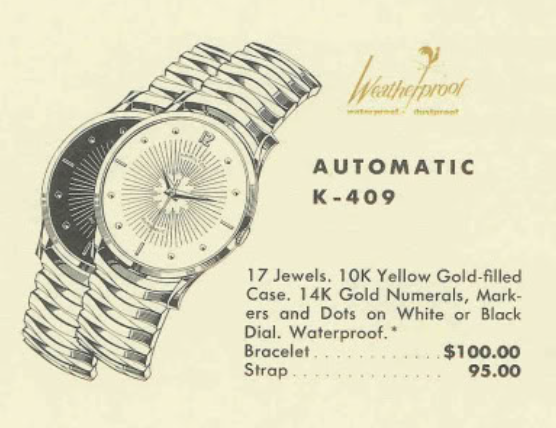 Although you can't really tell from the catalog that the K-409 has a two-piece dial. The K-409 comes in a 10K yellow gold filled case. I recently picked up a K-409 project watch and it was probably one of the roughest projects that I've taken on to date. It arrived without a crystal and with a serious case of "dial rash" as a result. The finish on the dial has crackled to an alligator skin effect. Even without a crystal, the watch is thick. One of the key external differences between the K-series of watches and the Accumatic line is the thickness of the case. This project watch came from a seller who was liquidating "a watchmaker's estate". I see that term used a lot with watch sales but in this case I think it's probably true. The movement grade is written on the case back in black sharpie. No, it's not a 199 grade, it's a 17 jewel Hamilton 661. There are a couple of issues I can see right away with the movement. First, it's missing the clutch that transfers the motion of the rotor to the winding wheel. Normally it's in the space where my screwdriver is pointing. Without the clutch, the rotor will spin but not wind the watch. Just to left of the screwdriver is a hole and in that hole should be the set lever screw. The screw is missing so there's nothing to hold the stem and crown inside the movement. You can see the crown, by the way, tucked into the side of the movement. This is a tricky watch to wind manually. There is not a lot of access to the crown. I couldn't pull the stem out of the watch and that's required in order to get the movement out. So I had to disassemble the movement while it's still inside the case. Once the rotor was taken off, I then had to take the train bridge off. I took out the third and fourth wheels and that gave me access to the rusty stem. Now that the stem is out there are two case screws to remove so that the movement can be freed from the case and come out the back. Now you can see the two-piece dial design that the K-409 uses. There's a small dial mounted to the movement and a dial ring that is mounted to the bezel. With the dial out of the way, you can see the movement has lost a lot of it's nickel finish. There's a bit of rust too but none of the parts appear to be compromised. The rusty stem may be solid but it's safer to replace it. Hopefully I'll be able to get the crown off without breaking the stem off inside of it. The best way to hold a stem for this type of work is with a tool called a "pin vice". Wow, look at all these parts! They don't all go to the same movement. I had a parts movement on hand to donate the missing parts but then I realized that the parts movement might be better than the movement that came with the watch. So I cleaned them both in the hopes that I'll get one good movement out of the two. The nickel finish on my spare movement is much nicer. After cleaning, it's bright and shiny. The hardest part of reassembling this movement is to get the large train bridge back on. You need to align three wheel pivots and then the bridge will drop into place. There's no forcing it... it drops into place or the pivots aren't aligned - it's that simple (but it's not easy). The rest of the parts go on and now the movement is running briskly. Next stop is the watch timer. Initially running a little fast, a quick tweak to the regulator slows it down to a respectable 11 seconds fast per day. Next stop is the other movement. I might as well put that back together as well. You can see the backside of the main plate has lost some of it's nickel finish too. This movement is now reassembled and running too. You can see the train bridge also has some brass showing though. It's interesting that the nickel finish is so worn but the rest of the watch is uncompromised. This move is running great too. So now I have my choice of two working 661's. That's "a good problem to have"... as they say. Well, it's a pretty easy decision to make as I'd rather have the movement with all of it's nickel plating. The next stop is to put the rotor carrier back on the movement. This is almost as tricky as the train bridge. Getting everything lined up can be a real challenge. Once it's back on, I can reassemble the front of the movement so that it can go back into the case. I'll put the rotor, aka oscillating weight, back on once the movement is reinstalled in the case. A new, uncut stem goes into the keyless works, along with a small dose of microgliss lubricant. Next on are the cannon pinion, minute wheel, setting wheel and hour wheel before the dial gets reattached. Everything is reinstalled in the case and the stem is cut to the proper length to inset the crown in the right place. I can screw the case back onto the watch and seal her back up. I gave the dial a "poor man's refinish" which means I cleaned the dial as best I could and then sprayed a very light coating of gloss lacquer on it. It's still a little cracked but it looks more than presentable under a new crystal - don't you think? A fresh black lizard strap completes the restoration and this K-409 is restored to new life. If I had one criticism of this watch it would be that it's a little hard to see the second hand. The gold lines on the dial blend right into the hands. This came out great! Nice job. Hay Dan, regarding the second hand disappearing into the radial lines - I had a donor non-K-409 watch that I saved just for it's cool red seconds hand, and luckily it fit the stem on my K-409. My local watchmaker installed it and it looks really cool. I'll send you a pic of it.